The county treasurer’s office serves the public in matters of property tax, motor vehicle title and registration, driver’s license, and non-driver identifications. The treasurer’s office in Montezuma is a full service facility located on the main floor of the Poweshiek County Courthouse. Visit the ‘Iowa Tax And Tags’ portal. MONTEZUMA – COURTHOUSE Ground level – 302 E. Main St.
For convenience use the Liberty St. entrance (South door) and take the stairs or elevator to the “Ground level”. If the title to your vehicle was altered, destroyed, lost, or stolen you may obtain a duplicate title for $25.00. If you just made an error on your title and you need a replacement you can surrender your title, complete an application for replacement title, pay $25, and get a title the same day. If you’ve lost your title and you need a replacement title you can complete an application for replacement title, pay $25, and after 5 days your title will be printed. If the scheduled print day falls on a weekend or holiday your title will be printed on the next working day. You can indicate on the replacement title if you would like the replacement title mailed to you or if you would like to come back and pick it up. The 5 day waiting period will NOT start until we receive the application for replacement title and the $25 payment. All of the vehicle information required on this form can be found on your vehicle registration. All owners on the face of the title must sign for a duplicate title- even if there is OR between the names. (1) Be sure to remove your license plates from the vehicle. Return these plates and registration to your county treasurer. a. Let the treasurer’s office know that you sold the vehicle, and on what date it was sold so they can apply for a refund if any credit remains on the plates. (2) Seller must sign and print their name on the back of the Iowa Title. See this sample title. a. If the front of the title shows ownership to : John Doe and Jane Doe then both will need to sign as seller on the back of the title. (3) Date the title with the date of sale. The date of sale must be clearly written without any alterations. Tips: Make sure your pen works correctly before dating the title. Write the date on a separate paper before writing it on the title. Be sure to use the correct month, date, and year. The date of sale should match your bill of sale date. (4) Although a bill of sale is not required when transferring an Iowa Title from a private sale, you may want to have one so that you have the buyer’s information if needed for future reference. The bill of sale does not need to be notarized. (5) If the year of the vehicle is 9 years old or newer (2007 or newer) the seller will need to complete odometer reading section and mark the correct type of mileage (actual, not actual, or exceeds mechanical limits). Tips: Mileage must be clearly written without any alterations. The mileage stated on the back of the title must be higher than the mileage stated on the front of the title. A duplicate title may be required if mileage is not clearly written or is inaccurate. (1) Make sure all the information that the seller put on the title is correct. If a mistake was made request the seller to obtain a duplicate title or complete an affidavit of correction. a. Duplicate Title: Will need to be applied for in the county that title was originally issued. Seller will need to complete an Application for replacement title. The fee is $25.00. By surrendering the title that has the mistake you will be able to obtain a title the same day that you apply for the duplicate title. If a title is not surrendered there is a five day waiting period to obtain the new title. b. Affidavit of Correction: can be filled out in place of obtaining a duplicate title for errors on the assignment of title line, if the seller or buyer signs in the incorrect location, or for errors with the date of sale. This form will need to be signed by both buyer and seller in front of a notary, and notarized. The notary’s commission date must be on the stamp or clearly written. (2) Be sure to keep record of the sellers name, address, and telephone number in case you need to contact them for future reference. (3) The title will need to be assigned to the desired applicants for title and registration of the vehicle. All owners on this assignment line will need to sign an Iowa application for title. a. You may want to fill out an Application for Title prior to coming into the office to transfer the title, especially if the vehicle is being transferred into John Doe or Jane Doe’s name and John Doe will not be present at the time of transfer. How much will it cost to transfer a vehicle? License Fee: Use the Weight & List Price Calculator to determine what the annual license fee is. If you do not register the vehicle for a full year it will be pro-rated. The buyer will be responsible for any prior delinquent licensing fees or penalties. If the title is not transferred within 30 days of the date of sale the buyer will incur title penalty and license penalty. How do I transfer Out Of State (OOS) titles? Titles differ from state to state. Each year we purchase a NADA guide that we can reference to see state by state titling and registration procedures. If a mistake is made on an OOS title we are required to follow that state’s requirements to fix the mistake. (2) Date the title with the date of sale. The date of sale must be clearly written without any alterations. Tips: Make sure your pen works correctly before dating the title. Write the date on a separate paper before writing it on the title. Be sure to use the correct month, date, and year. The date of sale should match your bill of sale date. (4) A bill of sale is required when transferring an OOS title. The bill of sale does not need to be notarized but must include the seller’s name, seller’s signature, buyer’s name, date of sale, make, year, and VIN of the vehicle. a. A bill of sale is required even if no money was exchanged for the OOS vehicle. (5) If the year of the vehicle is 9 years old or newer (2005 or newer) the seller will need to complete odometer reading section and mark the correct type of mileage (actual, not actual, or exceeds mechanical limits). Frequently OOS titles will only have two boxes (not actual or exceeds mechanical limits), and by not checking either box you are claiming it to be actual mileage. (6) If the year of the vehicle is 7 years old or newer (2007 or newer) the buyer will need to complete an Iowa Damage Disclosure Statement and complete section 2 of the form. The buyer will sign where it says buyer’s signature and also date. How do I contact the Iowa Department of Transportation (IDOT)? Use the Dealer Inquiry Tool Click here. Then click on “Fee Calculators” under “Registering a Vehicle”. An “ARTS” page appears that says Welcome Motor Vehicle Guest”. Hover over where it says Tools in the top left hand corner and click on Dealer Inquiry. for $_______________ on ____________________ . A bill of sale form is provided if the buyer of a vehicle wants documentation of the sale and/or the seller wishes a receipt of the sale. 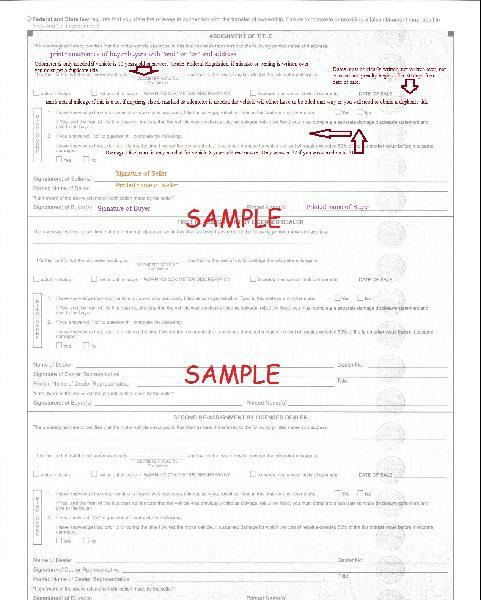 It is not necessary to use this form, but the below information should be included in any bill of sale. When can I renew my vehicle registration? Vehicles may be renewed during a three month window around your renewal month without penalty. This includes the month prior to your renewal month, your renewal month, and the month following your renewal month. If the last day of the three month window falls on a Saturday, Sunday, or holiday, renewals can be completed on the first business day of the following month without penalty. Following the three month renewal window a penalty is assessed at the rate of 5% of the fee due, per vehicle, per month, rounded to the nearest dollar, with a minimum penalty of $5.00 per vehicle. When the last day of the month is a Saturday, Sunday, or holiday, renewals can be completed on the first business day of the following month without added penalty. Vehicle owners receive an annual renewal notice sent from their County Treasurer. Penalty will still accrue and cannot be waived if you do not receive your notice. On or before the “enforcement date”, for large plates, Iowa law requires the registration validation sticker, often called a tag, to be affixed to the lower left side of the rear plate; for small plates the tags should be affixed to the upper left corner. Law enforcement defines the enforcement date as the first day of the second month following the registration month. It is recommended that the renewal be processed and the sticker be affixed to the license plate on or before the enforcement date. How do I get Specialty Plates? Please visit the Iowa DOT Personalized & Specialty Plates page to complete your order through a NEW and EASY online process. Or complete a Special Plate Application and mail it to: Iowa DOT Office of Vehicle Services PO Box 9278 Des Moines, IA 50306-9278. The plates will be mailed to the Treasurer’s Office. We will send you notification when the plates are in. You will need to surrender your old plates to receive your new plates. How do I register a truck with 28 ton or higher? If you are renewing a truck registered with 28 Ton or higher you will need a current 2290 Form that has the correct VIN of the vehicle being renewed. The form must also be stamped by the IRS with a received date. More information, including the form and instructions, can be found at the IRS website. You can only renew semi-annually if your registration month is December. You can choose a different month for registration, however you will be required to pay one full year’s registration fee. You will need to come into the office to register the homemade trailer. We will need you to be sure that the trailer weighs 2000 pounds or less. We will need to know the color of the homemade trailer, and a description of the trailer. We will complete an application for registration that all owners of the homemade trailer will sign. It will be registered as a specially constructed small regular trailer. Small trailers are not issued titles, they are only issued a registration. In order to store a vehicle the vehicle registration must be current. Bring in the plates and registration for the vehicle. We will place the vehicle in storage and stamp your registration with our “stored” stamp. How do I obtain an Iowa Driver’s License? Follow the below guidelines if you have an out of state driver’s license and are wishing to obtain an Iowa Driver’s License or view the Iowa Driver’s License and ID checklist brochure. Certified Birth Certificate issued by a state of the United States. It must be a certified copy and have the stamp or raised seal of the issuing authority. If your current full legal name is different than the name listed on the identity document from step 1 you must bring documents that connect the name on the identity document you selected to your current full legal name. If your name has changed from your maiden to married name we will need to see a Certified Marriage Certificate that links your maiden name to the married name. We can only accept marriage certificates that are issued by the state office of vital statistics or equivalent agency in your state & must be a certified copy with a stamp or raised seal. If your name has changed due to a court order we will need one of the following that applies to the situation: court order under petition for name change, court order for name change in a divorce decree or decree of annulment, court order for name change in a decree of adoption. If you are unsure whether your documents are sufficient to prove your residency please contact our office. You must surrender your current Driver’s License when obtaining an Iowa Driver’s License. Be sure to bring your current driver’s license with you. Wait to fill out the back side of this form until you are in front of the driver’s license staff. If you fill out the back side of this form prior to coming into the office it must be notarized. Be sure that the principal or superintendent’s signature is legible. What can my son or daughter do with their minor school license? Do I need to be present with my son/daughter for them to be issued an instruction permit? A parent or legal guardian will need to present in order for an instruction permit to be issued. However, your child can take the test without a parent present. Where can I find a study guide for the operator’s test? We have the Iowa Driver’s Manual in our office and available online at http://www.iowadot.gov/mvd/ods/dlmanual.htm. There is a practice test available at http://www.iowadot.gov/mvd/ods/iadrivertest.html. First time Driver’s License: How do I obtain an Iowa Instruction Permit when I am over the age of 18? If you have not been issued an Iowa Photo ID you will need to bring your social security card, certified birth certificate, and two pieces of mail that show your physical Iowa address. An instruction permit is not required before obtaining an Iowa Driver’s License. What are the testing hours for taking the operator’s test? The Poweshiek County Driver’s License Station is located on the lower level within the Poweshiek County Courthouse on Monday, Tuesday, Thursday & Friday from 8:00 am to 3:00 pm for testing. The Poweshiek County Driver’s License Station is located on the lower level within the Poweshiek County Courthouse on Monday – Friday.